I've seen it rain cats and dogs. But cows? A Michigan couple, Charles and Linda Everson, were driving along Highway 150 near Manson, Washington, when their minivan was hit by a 600-pound cow. Apparently, the cow fell off a nearby cliff and plummeted 200 feet to the road below. The Eversons, who were in the area celebrating their one-year wedding anniversary, escaped death by mere inches. The cow was less fortunate and had to be euthanized at the scene. 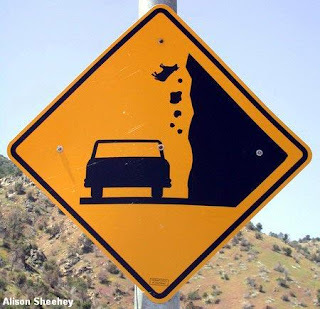 I used to be freaked out by those "falling rock" signs when I was a kid. I thought that meant it was a common occurrence for giant boulders to just come crashing down on cars. Now cows too?